Before this film, the reputation of Belgian artist Peyo’s most popular creations – the blue-skinned creatures known as the Smurfs – was in dire need of being cleaned up after not one but two horrible live-action/CG hybrids that took the very worst of kids’ film tropes, and cynically meshed them all together to make films that despite their critical beating collectively took in more dough worldwide than the last James Bond film. First, a sigh of relief for the fact that Neil Patrick Harris nor any live-action human is in this new fully-animated reboot, nor is there any magical portal to New York City or any of that rubbish. Instead, Smurfs: The Lost Village plants itself deeply into the fantasy world that the Smurfs inhabit, with character designs that are far closer to Peyo’s original drawings, and is frankly all the better for it. In this film, the Smurfs co-exist as normal with their differing personalities, except for the sole female of the group Smurfette (Demi Lovato), who finds it difficult to fit in with the male-dominated society. 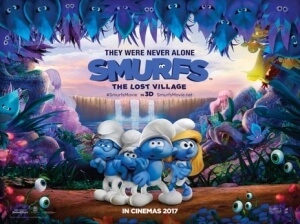 However, once she learns of a hidden civilisation of previously unknown Smurfs, she and a small group of friends – including Brainy Smurf (Danny Pudi), Clumsy Smurf (Jack McBrayer) and Hefty Smurf (Joe Manganiello) – defy the protective wishes of Papa Smurf (Mandy Patinkin) and set out to find them, before the evil wizard Gargamel (Rainn Wilson) gets there first. As far as kids’ films go, this isn’t bad but it’s certainly not Pixar-level quality either (although, did you ever expect it to be?). It’s completely harmless, offering young children enough colourful visuals to entertain them, while adults can appreciate the gorgeous animation on display, including some creative designs of creatures and plant life that characters come across. It’s a fine little adventure movie that your young ones can enjoy without you feeling guilty that you’re exposing them to it, which is a far cry from something like the previous attempts to bring the Smurfs to the big screen, which this film far and away blows right out of the water by comparison. It does have a few obnoxious trends of incorporating modern-day lingo and references into this supposedly timeless fantasy world; characters will refer to things like selfies while pop music plays on the soundtrack that tends to be more distracting than actually adding to the scene, while phrases like “nailed it!” are uttered at least once or twice throughout the film. It’s the usual kind of stuff you’d expect to see in certain animated kids’ films that’s made by people who haven’t quite figured out the Pixar formula, but in Sony’s case at least this is a major step-up from having the Smurfs rap into the camera or Hank Azaria using a wine bucket as a chamber pot. After stuff like that, suddenly hearing them make references to selfies doesn’t seem so bad. It might also be the first of any of these Smurfs movies – even some of the other fully-animated ones, like 1979’s The Smurfs and the Magic Flute – to appeal far more to the young girls in the crowd, with its larger focus on the character of Smurfette, who is essentially the lead in this film, and the discovery of the lost village in the title, which – mild spoilers – is an all-female tribe. The inclusion of Smurfette in the otherwise male-dominated Smurfs lore has often been accused of female tokenism, so this movie decides to fix that unbalanced demographic with a story that deliberately explores those type of gender politics in this universe. It all leads to a decent message of empowerment for young girls, which isn’t necessarily one would expect from something like The Smurfs but it’s welcome all the same. If Sony continues to go in this direction with future movies featuring the Smurfs, then maybe the painful memory of those horrific previous movies will slowly be erased and replaced with something much closer to Peyo’s original creations. So far, they’ve not done a bad job of that. Smurfs: The Lost Village is an innocuous fully-animated reboot of the franchise, one that is far superior to both previous live-action/CG hybrids in nearly every way, with some gorgeous and colourful animation that’s closer to Peyo’s original designs, and a decent message of empowerment for young girls that’s welcome in this universe. It’s not great, but it’s definitely not a piece of Smurf.